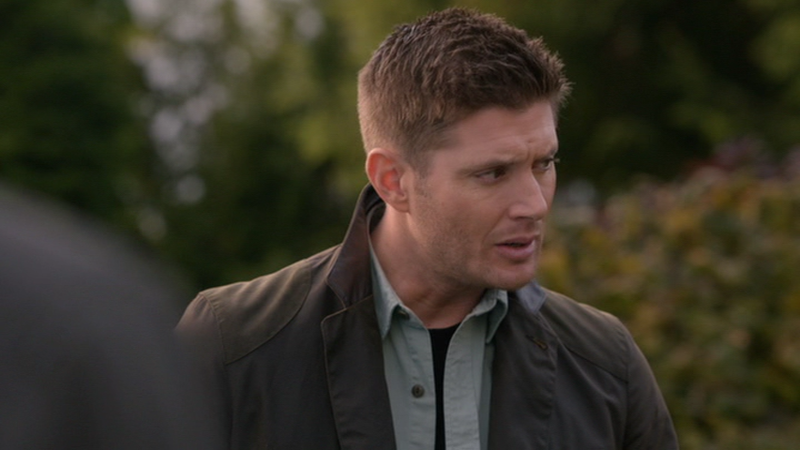 This shirt has tiny buttons in comparison to the usual size of Dean’s buttons. The shirt itself is a very light green/off-white colour. The buttons are dark brown or green. In Just My Imagination (11x08), Dean wears this shirt when he and Sam go to investigate the death of Sully’s pal, Sparkle. He wears it for the rest of the episode, except for briefly, when he wears a child-psychologist disguise in order to see Sparkle’s body. In O Brother Where Art Thou (11x09), Dean wears this shirt when they go to Crowley’s throne room to recruit Rowena. Hi, what's up, same friend? Nothing much. Oh, if you're wondering why I didn't put the brand name up there, it's because I'm not sure it's the same shirt. I don't have much to go on with this one, but I figure anyone who wants to know will see your comment.